The Taliban took control of Pakistan. They set up a radio broadcast and started telling people to burn their books, their CD's and DVD's, and to keep the girls away from schools and return back to the old ways of Islam. But one girl named Malala Yousafzai spoke out. Malala refused to be silent and fought for women rights to get an education. Malala was shot in the head at point blank range while riding the bus home from school. Malala said,"I don't want to be thought of as the girl who was shot by the Taliban but the girl who fought for education,"(Page 309). Malala recovered and now has taken her to the halls of the United Nations in New York. At 16 she became a global symbol of peaceful protest and the youngest nominee ever for the Noble Piece Prize. Malala has many leadership qualities and she uses them to change the views of people around her. Malala showed a great amount of courage by speaking out against the Taliban in support of girls right to education. Malala said, "In my heart was the belief that god would protect me. If I am speaking for my rights, for the rights of girls, I am not doing anything wrong," (Chapter 11, Page 141). Malala has a good sense of justice and wants to change the world for better. Malala would give interviews and write diary entries for the BBC website about life under the Taliban. Character vs. Character- Malala has a conflict with the Taliban. 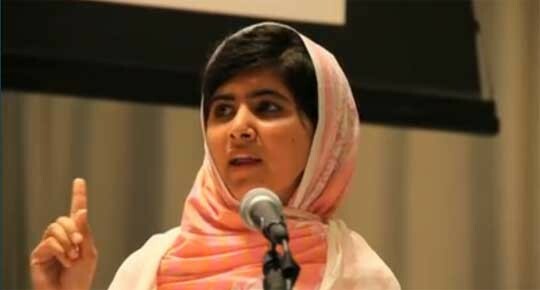 The Taliban opposed Malala's idea of having universal eduction. Malala said, "Taliban are not our rulers. It's my life; how I live it is my chose,"( Page 311). Character vs. Self- Malala had to make some hard decisions. She had to decide whether to continue her education in the face of the Taliban threats or to give up her campaign and be safe from the constant fear of being killed. Malala says, "My feeling was nobody can stop death. So I should do whatever I want to do." (Chapter 18, Page 224). Character vs. Society- The conflict is the women in Pakistan against the society that tries to oppose their rights. Women in Pakistan are oppressed by the society and treated as second-class citizens. Malala has to fight against those who criticize her idea and accuse her of spreading false information. Malala believes that the lack of education is the main cause to of all problems, as she said "Why should a girl's life be ruined to settle a dispute she has nothing to do with?" (Chapter 18, Page 218). Don't be afraid of anyone and stand up for yourself. This shows readers that no matter who the person is don't let them bully you and stand up for yourself. "Taliban are not our rulers. It's my life; how I live it is my choice." This quote shows that Malala is not afraid of the Taliban and that she is standing up for herself. 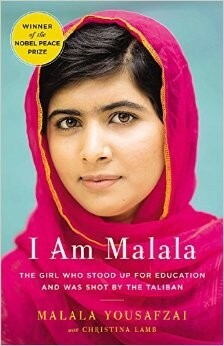 The most powerful part of the book was when Malala spoke out for women's rights to get an education. It was powerful because Malala had enough courage to go fight against the Taliban even though she was at risk of getting killed. My favorite quote was, "Taliban are not our rulers. It's my life; how I live it is my choice." I thought it was meaningful because it shows how Malala is not scared to go up against the Taliban and that she is standing up for herself and will not live the way other people want her to live. I would rate this book about a 5. I thought it was very well written and had a lot of explanation in it. I also liked this book because it had a lot of action and drama in it. Also the thing about this book is that it never really got boring. I thought this was a very good book.